This is my pin cushion. 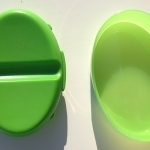 It has two parts, a cover and a magnetic bottom. 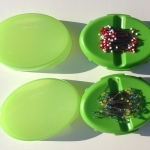 Magnetic Pin Caddy with lid on. Magnetic Pin Caddy with a few pins. 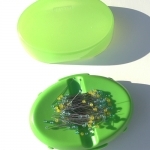 I use several magnetic pin caddies by Clover. 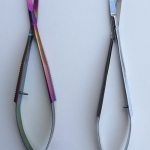 They come in three different colors, pink, green and purple. 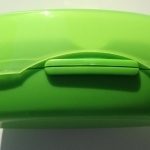 Mine pin caddies are green. I like them because the pins are always aligned in the same way so I don’t hurt my fingers when trying to grab them. 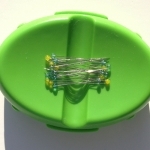 Each pin caddy holds a specific kind of pins. I use different pins for different jobs. Then, the pin caddies are covered and stacked to save space. 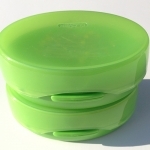 Stacked pin caddies with lids. My favorite pins to use for patchwork are very fine pins, also by Clover, these are item number 2507, I include the item number because Clover has other items called “Patchwork Pins (Fine)” and not all of them work the same. They are 0.4mm thick and 36mm (about 1.25″) long are made from steel and have glass heads which make them heat-resistant. Glass head- extra fine patchwork pins. 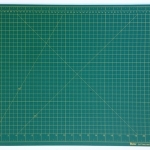 My favorite cutting board is a self-healing green board. 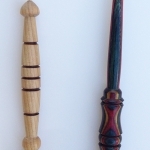 I have several of them, in different sizes and brands, and are used for different projects. Big projects require big boards, small projects small boards. These are smooth boards that are easy on the blades. 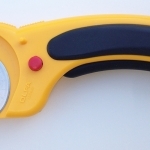 I use rotary cutters that are made by Olfa. The ones I use are ergonomic and are good for right or left-handed people. All you do is place the blade on the other side. The blades are also Olfa. They last a long time. 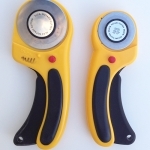 The 45mm rotary cutter is set up for a left handed person. 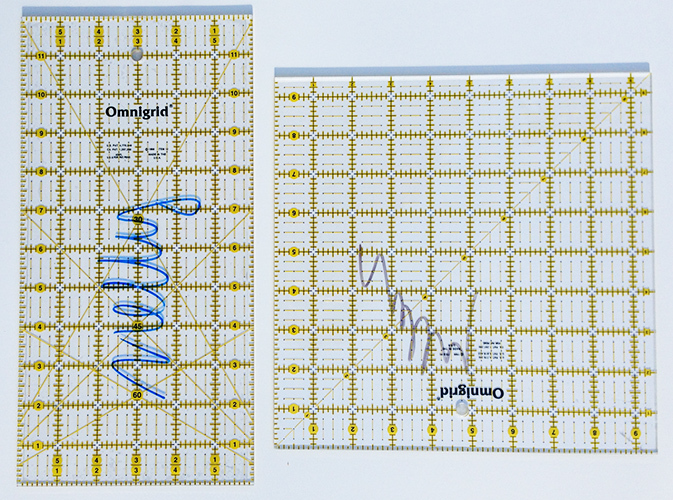 The rulers I like best are made by Omnigrid. They are transparent, have yellow and black lines and there are gaps in the lines. These gaps are great to allow the user to see where the edge of the fabric is (or whatever you are cutting). 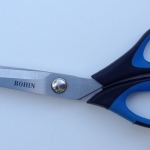 This feature is excellent for more accurate cutting. The yellow lines are great to see measurements on dark fabrics and the black lines are perfect for light colors. 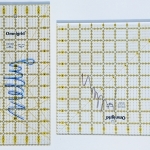 I started with one ruler, the one that is 6″ x 24″, I used that ruler for a very long time until I felt the need for more. The second ruler I added to my ruler collection was a 6″ square and then a 12.5″ square, great to square up blocks and cut wide pieces of fabric. 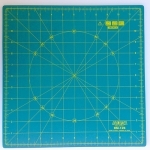 I have added a few other square rulers, 6.5″, 9.5″ and 15″. 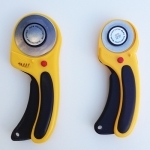 Also a 12″ x 6″ and a 6.5″ x 24″. I do put my name on my tools, this way if I leave them behind people will know who they belong to. I also use a stiletto to help with fabric alignment and pressing. 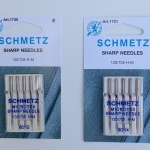 The sewing machine needles I prefer are by Schmetz and are microtex-sharp needles. The size will depend on the kind of thread. 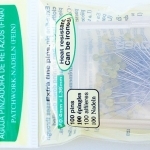 My favorite sewing machine needles. 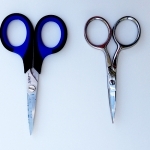 Scissors!! Of course scissors. We need many of them. 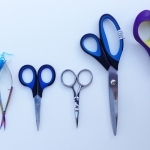 Little straight ones to cut thread in between patchwork pieces, longer ones to cut paper and even longer ones to cut batting. 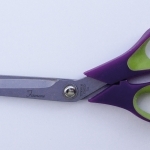 I can’t leave out my favorite snips from Famore (famorecutlery.com), I have several of these, one at each machine, specially at my longarm machine. 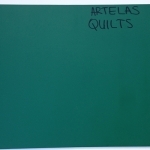 They cut thread very close to the quilt without cutting the fabric because they are curved.